American Dryer has been manufacturing hand dryers since 1952, enabling those who maintain public restrooms to do away with wasteful paper towels. 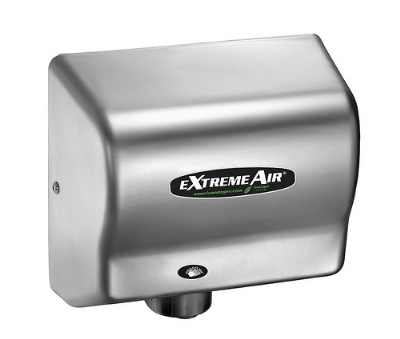 Their eXtremeAir, Advantage, and Global lines are energy-efficient and durable, and span a wide range of features and prices to meet any operation's needs. No longer have to purchase paper towels, saving on the purchase price and delivery costs. Use fewer trash bags and create less waste for pickup. Reduce labor and time spent on cleaning restrooms. Lower energy use and utility costs than standard hand dryers. In addition to reducing operating costs, purchasing one can help your business gain LEED credits, which can, in some locations, translate into grants and tax credits1. American Dryer manufactures five lines of hand dryers. Below is some information about each of them to help you find the model that will work best for your business. The cover is vandal-resistant, with tamper-resistant screws and protected air intake vents. The 1/12 HP motor is maintenance-free and permanently lubricated, and the nichrome heating element includes a thermal protector. An automatic sensor turns the dryer on when the user puts his or her hands under the opening, and allows the dryer to run for a maximum of 60 seconds. This model's 63-decibel sound level is the quietest in its class. The cover features tamper-resistant screws and shielded intake vents to deter vandals. The energy-efficient sensor activates the 1/8 HP motor, and will blow air for as long as 35 seconds. Average dry time is only 25 seconds, and the sound level is the quietest in its class at only 67 decibels. The nichrome heating element has a thermal protector to prevent overheating for maximum life. This model was American Dryer's first to feature adjustable sound and speed. The speed is adjustable, with the corresponding sound levels ranging from 69 to 83 decibels. This unit's dry time is as quick as 10 seconds. This model is also compatible with any voltage from 100 to 240 volts. The GXT series is GreenSpec® listed, Greener Product certified, and can contribute to a building's LEED credits. With its cool-air design, the EXT model blows air at 85 degrees F to use as much as three times less power than other hand dryers that claim energy efficiency. This model is GreenSpec listed and can help businesses qualify for LEED credits. This unit's sound and speed are adjustable so you can find the balance that works for your business. It is GreenSpec listed and can also help buildings qualify for LEED credits. 1. Good to Know: Green Building Incentive Strategies U.S. Green Building Council. Accessed October 2015. 2. Cost Calculator American Dryer. Accessed October 2015.